VINTAGE COSTUME ANTIQUE JEWELRY MATCHING JEWELRY SETS - PARURES! Miriam Haskell White Vintage Necklace And Clip Earrings Matching Jewelry Set - ParureFor Weddings, Proms, Pageants And Parties! 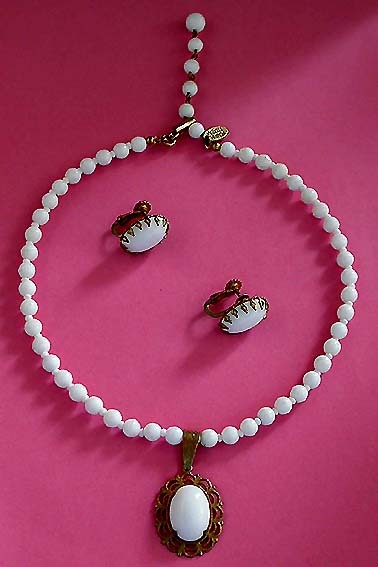 Miriam Haskell White Vintage Necklace And Clip Earrings Matching Jewelry Set - Parure. 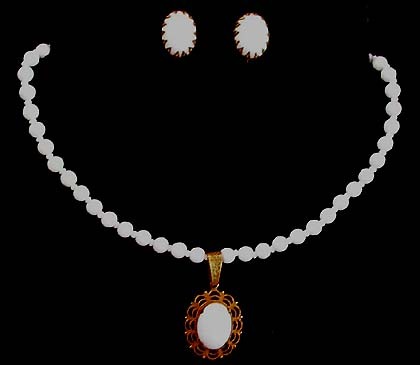 Item #S16866 - Miriam Haskell White Vintage Necklace And Clip Earrings Matching Jewelry Set - Parure. Size: Necklace - 16 1/2" (14" + 2 1/2" extension). Clip On Earrings - 3/4" x5/8". Designer: Marked MIRIAM HASKELL on hanging oval tag. Miriam Haskell made high end jewelry since 20's. Her costume jewelry is the collectible of the collectibles. Most of her pieces were signed from the 1940's onward. Miriam Haskell glossy thermoset snow white beaded necklace with small white beaded spacers tightly strung and a oval pendant of white stone prong set in an antique style goldtone frame. The matching screw back clip on earrings are crown set into goldtone. A very simple yet elegant Miriam Haskell jewelry set. Excellent condition. A fabulous matching Jewelry set to wear at weddings, prom nights, pageants, parties, cruises and special functions! US$98.00. SOLD.